WOKING enjoyed a bank holiday bonanza, as The Cards notched up wins home and away. Despite going in at half-time on Saturday 1-0 down to Truro City, thanks to a corner converted by visiting captain Jamie Richards, Woking stormed back to win the game 3-1 through goals from Kane Ferdinand and Jack Cook. 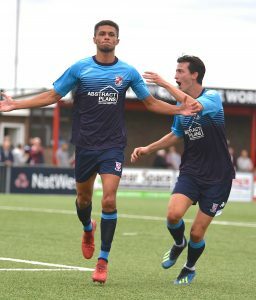 Then a late winner from Ferdinand maintained Woking’s place at the top of the National League South table with a 2-1 victory at Eastbourne Borough on Bank Holiday Monday. After missing a penalty against Truro City on Saturday, Max Kretzschmar made amends by slotting away his third spot-kick of the season to give The Cards a fifth-minute lead. Kane Wills equalised for the hosts in the 63rd minute, but Ferdinand won it with four minutes remaining, bringing an end to Borough’s unbeaten start to the season.